These handmade stoneware bowls are functional pieces of organic beauty. Inspired by the serenity of the seashore and the simple pleasure of everyday meals, these handmade stoneware bowls are functional pieces of organic beauty. 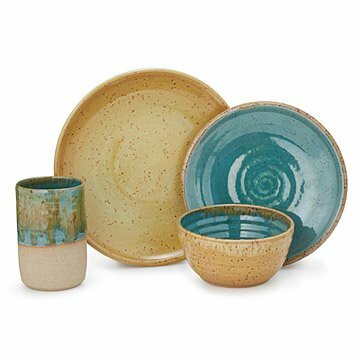 Each one is hand thrown on a potter's wheel, hand trimmed and finished, and dipped in amber and nautical teal glazes. Handmade by Jeana Greulach in Westlake Village, California. Jeana Greulach imagines people using her pieces to enhance the beauty in their daily lives. The Southern California-based ceramicist crafts each of her unique pieces to embody an intention, like staying open to what life brings (check out her Open-Minded Couple Mugs). “I’m patient with inspiration,” she says. “Over time I’ve realized it comes organically, not when I’m trying to force anything.” With a bit of rustic elegance and story, her pieces feel timeless and individual, making them prized gifts for loved ones. Jeana lives and works in Westlake Village, California.